In my dream, I was having dinner with my wife and 2 year old son in a very fancy restaurant. The whole place was nicely decorated and the waitresses wore gleaming gold dresses. And we seemed to be the only diners there, so everyone was fussing over us. All the cutlery and other tableware in the restaurant were made of beautiful polished pewter. I was thoroughly enjoying the sight of so much pewter in one place. Even my son was happily fooling around with his reflection off every pewter item he could grab. The mirror-finish was, well, like a mirror. But, err, I couldn't exactly remember what we were eating. Then somehow, in a blink of an eye, we had finished the main course and the dessert. All I could remember then was that we were having some coffee. I was chatting with my wife about something. More like mumbling because I didn't have a clue what I said. Anyway, we tried to pacify him but he got even more agitated. Then, in slow motion (just like in the movies), he stretched out his hand and grabbed a pewter creamer pot on the table. Before my wife and I could get it off his hand (we were also moving reaaallll slooowww....), he threw the pot away like a baseball pitcher. That projectile pot and its contents flew (again, slow motion) and out of nowhere a waitress was standing right in its path. Needless to say, the pewter creamer pot hit her. Right smack on her forehead. I didn't remember what happened to her. I was watching the pot and it fell to the floor, spun a few times and then came to a stop. There was a huge dent on its side. And then I woke up. And went back to sleep. 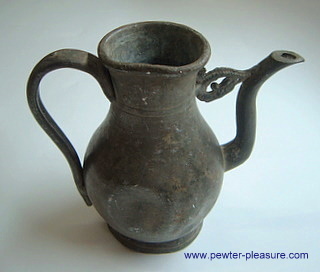 That was the feeling I had when I saw this little dented pewter creamer pot. And the dream just rushed back to me right then.